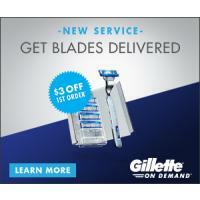 Gillette® On Demand™ is an online-only service that lets you quickly order Gillette razor blades. First choose the razor blade right for you. Second select how to order them. And blades will be conveniently shipped to your home. You must click on the offer to get the savings.